Don’t forget: the book mentioned below is available at 20% off for tablehopper readers for two weeks following this mention at Green Apple Books—simply use the code “tablehopper” at checkout (either at the store or online) for your discount. April happens to be National Grilled Cheese Month, perfect timing for Grilled Cheese, Please! 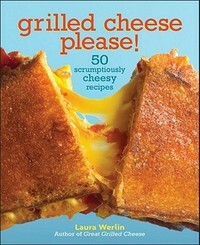 : 50 Scrumptiously Cheesy Recipes by Laura Werlin. This is the author’s second book devoted to the grilled cheese sandwich, so you can bet she takes it way beyond white bread and processed cheese. As for the star ingredient, most of the cheeses are quite approachable and readily available anywhere. Note that Werlin doesn’t skimp on cheese: any given sandwich can have upwards of three ounces. When she calls for specialty regional cheeses, she takes care to suggest close substitutes (she’s an award-winning cheese author, by the way, so she knows her stuff). Case in point, the Hog Island grilled cheese recipe—a San Francisco fave usually made with a local cheese called St. George—is a rather good approximation of the original when made with cheddar and Havarti. Tasted side by side, I can’t deny that the St. George is nuttier and more complex, but both are still quite satisfactory. You’ll find a good variety of recipes, some of the author’s own creation, others from grilled cheese-focused restaurants and food trucks. Werlin uses compound butters quite freely to slather the breads with more flavor, mixing in spices, herbs, even crushed tortilla chips. There are recipes that are inventive takes on international flavors (like Greek and Spanish), meats paired with sweet-tart fillings (like chorizo with apple and dates), as well as riffs on classic American sandos (like a Philly cheesesteak). Check the Ultimate Childhood Flashback: white bread with mayo, American cheese, dill pickles, and potato chips inside the sandwich. If only I could figure out how to keep the chips from getting soggy… Accoutrements are included too—tomato soup, deep-fried pickles, jalapeño relish, and more. The book also keeps things interesting with outside-the-box variations. The spinach, egg, and manchego grilled cheese uses frog-in-the-hole style construction; it’s good for a hearty, runny-yolked breakfast. The open-face Dutch Treat makes for an easy, sweet dessert with banana, Gouda, and brown sugar caramelized under the broiler (though I should’ve made sure to cover the corners of my toast with cheese to keep it from burning). And the arepa made of griddled corn cakes, Monterey Jack, plaintains, and black beans sounds promising—it’s next on my list of recipes to try. Werlin’s recipes are straightforward and mostly repeat her own particular grilled-cheese-making methodology. A couple of her key steps: grate (don’t slice) the cheese, butter the bread (not the pan), cover, flatten (slightly), flip twice. Simple, right? Lucky for us, it doesn’t take rocket science to get rich, gooey, crispy results. Featuring vibrant photos by Maren Caruso, this is a cute and fun little book that will surely have you saying “Yes, please!” to grilled cheese.